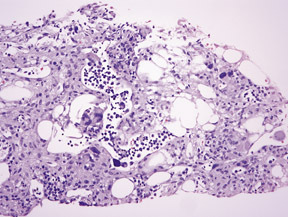 Hepatocellular carcinoma (HCC), hypervascular metastasis and hepatic adenoma. HCC was highly considered in the differential diagnosis based on the behavior during the early and late phases of contrast enhancement. A core liver biopsy was performed underultrasound guidance and histologic examination led to the diagnosis of extramedullary hematopoiesis (EMH) with no morphologic evidence of a malignant neoplasm. 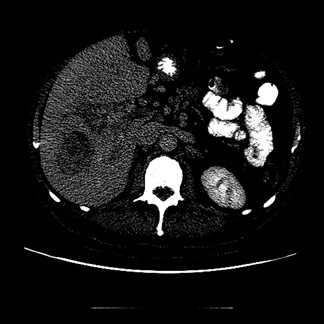 CT of the abdomen following administration of intravenous contrast material revealed splenomegaly and an indeterminate low-attenuation lesion in the right lobe (segment VI) of the liver. On follow-up imaging (6 months), the mass within the liver demonstrated interval growth. 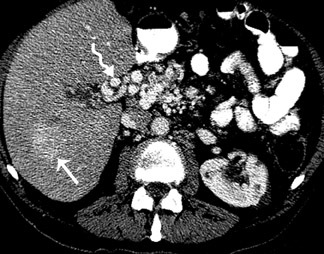 The pre-contrast CT images demonstrated a 5 cm x 4 cm hypodense mass (Figure 1). On the post contrast CT, the mass exhibited enhancement. During the early arterial phase, 20 sec after contrast injection, of a multiphase post contrast CT study, there was heterogeneous peripheral enhancement (Figure 2A). On the late arterial phase, 45 sec after contrast administration, there was progressive contrast enhancement (Figure 2B). On the portal venous phase, 60 sec following the administration of contrast, the lesions became isointense to the liver parenchyma (Figure 2C). 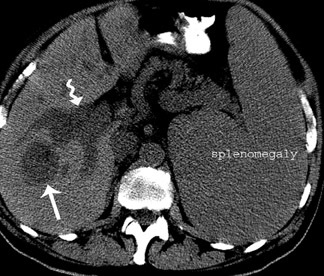 On the delayed phase, 90 sec post contrast administration, the mass was hypodense to liver (Figure 2D). Cavernous transformation of the portal vein, as a result of portal vein thrombus, was noted (Figure 3). The pathogenesis of EMH is incompletely understood. The most popular hypothesis is that EMH is a response to bone marrow failure. However, at least in patients with idiopathic myelofibrosis and other chronic myeloproliferative disorders,an alternative pathogenesis has been proposed. The alteration of the bone marrow microenvironment, as a result of fibrosis, leads to premature exit of hematopoietic cells from the bone marrow.2 EMH has been suggested to result from hematogenous spread of multipotential stem cells, with their being filtered out of the blood in various organs and tissues. Common anatomic sites include the spleen, liver, kidneys, adrenal glands, lymph nodes, lung, pleura, skin, breasts, dura mater, ovary, thymus, gastrointestinal tract and central nervous system. 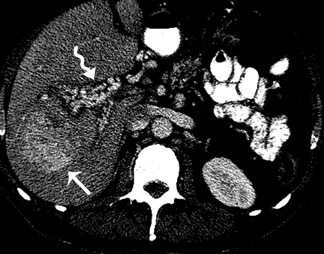 CT findings of EMH in the liver have been described in the literature.3,4 EMH may present in the liver as solitary or multiple lesions. The unenhanced CT in appearance is variable: hypodense, hyperdense and heterogeneous.5 Contrast-enhanced CT is also variable; no enhancement, heterogeneous, and delayed enhancement in a multiphase report. 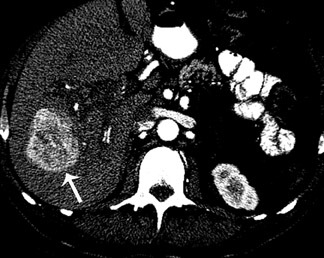 To our knowledge, EMH that mimics the CT features of HCC has not been described in the literature and it is important to consider this entity in the appropriate clinical setting. EMH in the liver can mimic tumors and is usually confirmed by biopsy. The liver sinusoids are dilated and contain numerous hematopoietic elements. Foci of erythropoiesis are most common. Small clusters of mature and immature granulocytes may be present. Megakaryocytes (Figure 4) are commonly seen and are identified by the presence of large multilobulated nuclei. In extensive cases, EMH is also present in the portal areas. EMH most commonly involves the liver and spleen diffusely. Rarely does EMH present as a solitary mass, posing a diagnostic dilemma. The final diagnosis of intrahepatic EMH can only be established by histopathologic examination by biopsy. A core biopsy is usually adequate for diagnosis. Fine-needle aspiration cytologic examination may also be diagnostic in florid cases of EMH. A review ofliterature suggests no definite treatment for EMH other than treating the underlying condition. Lemos LB, Baliga M, Benghuzzi HA, Cason Z. Nodular hematopoiesis of the liver diagnosed by fine-needle aspiration cytology. Diagn Cytopathol. 1997;16:51-54. Wolf BC, Neiman RS. Myelofibrosis with myeloid metaplasia: Pathophysiologic implications of the correlation between bone marrow changes and progression ofsplenomegaly.Blood. 1985;65:803-809. Wiener MD, Halvorsen RA, Jr., Vollmer RT, et al. Focal intrahepatic extramedullary hemat-opoiesis mimicking neoplasm. AJR Am J Roentgenol. 1987;149:1171-1172. Tamiolakis D, Venizelos J, Prassopoulos P, et al. Intrahepatic extramedullary hematopoietic tumor mimicking metastatic carcinoma from a colonic primary. Onkologie.2004;27:65-67. Gupta P, Naran A, Auh YH, Chung JS. Focal intrahepatic extramedullary hematopoiesis presenting as fatty lesions. AJR Am J Roentgenol. 2004;182:1031-1032. Extramedullary hematopoiesis mimicking hepatocellular carcinoma. Appl Radiol.